This is pretty much how we’ve been spending time lately. 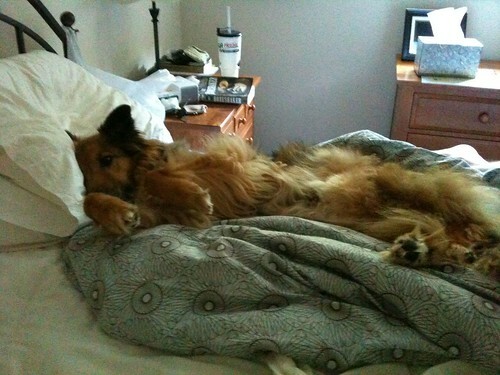 Bill was home sick last Friday and slept almost all day. On Thursday night, he thought he would be able to help me with a paint project I had on the to-do list for Friday. I managed to do it by myself while he napped (for four hours). The project was not exciting and easy enough. I was repainting some trim on the patio. It’s the set up and the taping that takes time but does make things easier. The project was completed and I managed to do it without spilling that much paint this time. The rest of the weekend was spent laying around and relaxing. I finished reading The Girl With the Dragon Tattoo which I enjoyed. We also watched lots of baseball and bike racing. I would have finished knitting my Sagano Shawl (rav link) except that I ran out of yarn on my bind off row. I am about 6 yards short. I’m contacting people on ravelry to see if anyone has scraps they would be willing to part with. This running out of yarn thing is getting quite frustrating. It’s the second time it has happened in the last two months. I’m weighing my yarn compulsively, reading other people’s experiences on ravelry. By all accounts, I really should have had enough yarn for the shawl. Yarn issues notwithstanding, it was a very pleasant knit and I enjoyed the daisy stitch. On Sunday night, I started to feel under the weather. I really thought I was in the clear as far as Bill’s cold was concerned, but yesterday and today I have been feeling quite crapsy. Bill is doing better so hopefully I will be on the upswing tomorrow. 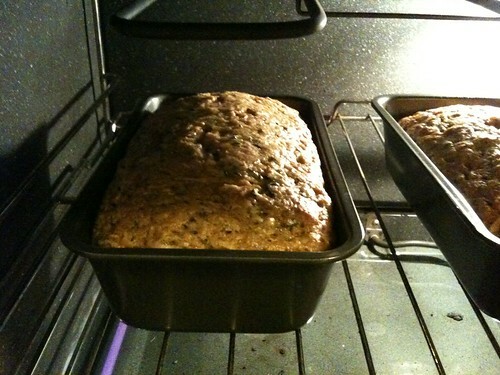 I did feel well enough to make some more zucchini bread. Our zucchini plant is doing pretty well. This is our third batch of bread, and we’ve used other zucchini in pasta, and we probably have enough left for a fourth batch of bread. I have made some healthy substitutions in the recipe, using applesauce for half the oil and egg beaters for half the eggs, and 1 cup of whole wheat flour for regular flour. Those are changes that, to me, don’t change the flavor or texture of the bread. I tried to cut some of the sugar, but that was noticeable and not so good. I am thinking of substituting some honey for some of the sugar, but that will require some experimentation and I wasn’t quite up to it on Sunday. I hope that you enjoyed your weekend, and that you aren’t dealing with a cold. It’s not fun.